Special Issue: Including Papers on "Deep-Seated Landslides"
Special Issue: Including Keynote Papers prepared for the "Shale Symposium at the International Congress of the ISRM Montreal, Canada May 10 -13, 2015". 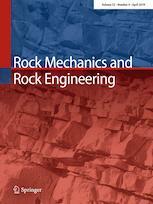 Special Issue: Including Selected Papers from the 48th US Rock Mechanics/Geomechanics Symposium, held at the University of Minnesota, Minneapolis, June 1 - 4, 2014. Special Issue: Including Selected Papers on "Anisotropy of Rock", dedicated to Professor Ove Stephansson on the occasion of his 75th birthday.